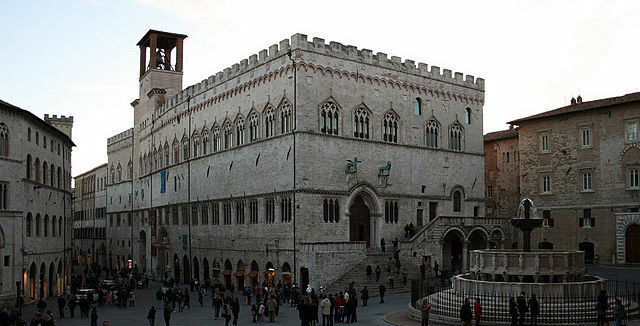 Perugia Italy, tourist attractions, facts and information. Perugia Italy, capital city of the region Umbria, is an ancient town situated in the northern part. The historical center rises on the high hills that flank the skillful river Tiber (IT: Tevere). One of the most visited cities of art, is a multiethnic and multicultural center with two important universities: University of Perugia (IT: Università degli Studi di Perugia) and University of Italian Studies for Foreigners of Perugia (IT: Università per Stranieri di Perugia). Perugia reassume the multiple characteristics of the region with an atmosphere of culture, art, history, religion, handicraft, and enogastronomy. The monumental Palazzo dei Priori, great example of the public building age, was built between 1293 and 1443. In Gothic style, is still today the city town hall. Perugia Italy has an immense artistic and cultural patrimony from its past. In every corner and public squares of the city, monuments that testify centuries of history, art and culture can be admired. It has two series of boundary walls: the Etruscan walls were built between the fourth and third centuries BC, with the monumental Etruscan arch gate (IT: Porta Augusta). The Gate of Mars (IT: Porta Marzia) is one of the ancient gates of the Etruscan walls. Porta Trasimena, also called arch of San Luca, located in Via dei Priori, was rebuilt in the fourteenth century. Porta Sole (EN: gate of the Sun) was one of the oldest doors in Perugia, no longer exists in its original form. Its name has been inherited from the actual arch of Lilies (IT: arco dei Gigli), now located in Bontempi Street and rebuilt in the Middle Ages. Arco della Mandorla called Porta Eburnea. Arco di Sant'Ercolano called Porta Cornea. Porta Sant'Angelo is the largest of the medieval gates of Perugia bounary walls. Porta di Santa Susanna, also called gate of St. Andrew (IT: Porta di Sant' Andrea, is located in Via della Sposa Street. All the region of Umbria has a generous archaeological patrimony that is distributed over much of its territory. Many traces remain of the Etruscan civilization but also of the Ancient Umbrii, other pre-Roman populations and of the Roman themselves. It boasts three national archaeological museums and important archaeological areas, as well as archaeological finds of absolute scientific and artistic importance.